Nearly a year in, however, the economic impact of Trump’s presidency on Asia continues to be mostly hypothetical. There has certainly been a great deal of rhetoric and statements of principle—including withdrawal from the TPP, demands for renegotiation of KORUS FTA, and calls for negotiation of a bilateral FTA with Japan—as well as the appointment of aggressive protectionists in key positions, but at least for East Asia, the practical reality to date has been the declaration of a few trade enforcement actions and some small-bore agreements with China on trade and investment. Thus, when Trump made his first official trip to Asia in November 2017, East Asian nations welcomed him to their shores with a combination of trepidation and cautious optimism, while also moving forward with planning for a regional economic order without US leadership. In this article, I take the opportunity offered by Trump’s visit to address the question of whether his administration is a force for cooperation or division among the economies of the Asia-Pacific. This involves three questions: First, does the Trump presidency represent continuity or radical change in US trade policy, both regionally and globally? Second, how are the countries of the Asia-Pacific reacting to Trump’s initiatives, exhortations, and threats? Third, what will be the likely shape of regional cooperation in the Trump era? I argue that the Trump trade agenda is indeed a radical change in US policy, but is likely to get bogged down as trading partners resist US pressure and work to develop new modes of regional cooperation that do not rely on US leadership or perhaps even participation. These are likely to disadvantage US firms and consumers and will instigate new contestation over the principles that underlie regional economic relations. There are two contending interpretations of the Trump administration’s approach to trade policy. The first is to see significant continuity with past practice. In this perspective, the Trump administration’s target is not free trade per se, but the tendency of trading partners to violate their obligations—whether through import barriers, export subsidies, or theft of intellectual property—and create an unlevel playing field. This is a traditional US trade hawk view that calls for either better trade agreements or more aggressive enforcement actions, potentially including unilateral measures to punish misbehavior. In short, this view sees the Trump administration as nothing new: trade negotiations and enforcement actions have always been central to the mission of the office of the US Trade Representative (USTR), although the intensity and targeting strategy of USTR have shifted over time depending on the concerns and constituencies of particular administrations.4 One piece of evidence in favor of this status quo interpretation can be found in the opening statement of USTR Robert Lighthizer at his confirmation hearing, where he asserted, “We can do better in negotiating our trade agreements and stronger in enforcing our trade laws. I further believe we need an international trade system that functions the way it was negotiated and that the United States must be ready to work with like-minded trading partners to ensure fair trade and to encourage market efficiency.”5 While it is hard to deny that much of the trade rhetoric of others in the Trump administration has been hyperbolic and bellicose, such statements reflect either a greater intensity of constituent concern over foreign competition or an energetic tactic to improve bargaining leverage versus trade partners, or a combination of both. Lighthizer himself, a former deputy USTR known for his toughness in US-Japan trade negotiators during the free trade-oriented administration of President Ronald Reagan, might be seen to embody this more muscular, but still pro-trade, approach. The alternative interpretation is that Trump and his trade team hold a radically different understanding of the relationship between trade and economic prosperity from that of any US administration in the post-Depression era. Evidence for this interpretation can be found in a variety of statements by administration officials and by Trump himself. Among these, perhaps the most authoritative was a policy paper by senior campaign advisors Peter Navarro (now Director of the White House National Trade Council) and Wilbur Ross (Secretary of Commerce), entitled “Scoring the Trump Economic Plan: Trade, Regulatory, & Energy Policy Impacts,” which was issued by the Trump campaign in late September 2016.6 The paper emphasizes what it calls “the self-inflicted negative impacts from poorly negotiated trade deals and the failure to enforce them,” highlighting in particular China’s accession to the World Trade Organization (WTO), which it claims led to “a flood of illegally subsidized Chinese imports” and “rapidly accelerated the offshoring of America’s factories and a concomitant decline in US domestic business investment.” The basis of the policy paper is what the authors call the “trade deficit drag”—in other words, trade deficits reduce economic production on a one-to-one basis. This assumption is at odds with the understanding of the vast majority of US economists, which is that trade deficits reflect simply the difference between production and consumption. The obvious implication of “trade deficit drag” is that reducing the overall trade deficit will make Americans richer. The Trump administration’s trade team seeks to operationalize this understanding by focusing on bilateral deficits. In conventional macroeconomics, the idea that the overall deficit can be reduced by reducing each bilateral deficit is a fallacy of composition. The reason is that the overall imbalance between production and consumption is driven by those large macroeconomic variables themselves—in other words, consumption patterns are driven not by a series of trading relationships, but by households’ preferences. If a particular bilateral deficit is forced to shift to balance, economists would predict either that imports would rise from another location or that households would consume less. At best, therefore, the “whack-a-mole” approach to narrowing one bilateral deficit at a time should simply shift the geographical pattern of imports without changing the overall trade balance. At worst, it would mean less consumption and lower economic welfare, and possibly recession. In contrast, the Navarro-Ross proposition holds that households denied access to desired imports from a particular country would instead consume a good or service produced domestically, thus raising domestic employment. This is a radical idea indeed. The substantive actions of the Trump administration to date could in principle reflect either continuity (albeit a very aggressive version of previous trade policy) or radical change. There is certainly a case to be made for continuity: The administration has abandoned the TPP, but that was an unpopular trade agreement that had not been ratified and Trump’s Democratic opponent Hillary Clinton had also pledged to oppose. The Trump administration has been aggressive in seeking to push for changes in the North American Free Trade Agreement (NAFTA), but the Obama administration sought to modify it as well in 2009 and arguably NAFTA does not adequately address many of the key changes in trade patterns (supply chain, information services, etc.) of the last quarter century. Trying to reopen KORUS FTA so soon after its ratification is certainly unusual, but KORUS FTA has never been a popular agreement, especially in the Rust Belt. Meanwhile, the administration’s trade enforcement actions, including on softwood lumber from Canada and intellectual property theft in China, build upon years of USTR practice. The Da Nang speech was a clear statement of the Trump trade agenda. While insisting that trade partners must eliminate unfair trade practices, the president made clear that success would be measured in bilateral trade imbalances, and that East Asian countries were on notice that their “chronic trade abuses” were unacceptable and would be punished by US trade action. Promoting Asia-Pacific Economic Cooperation without the United States? 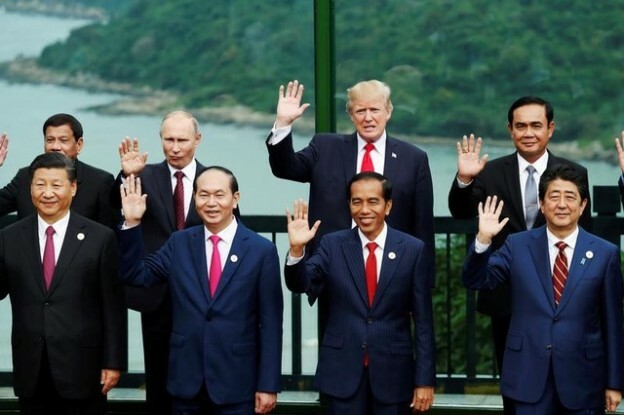 With prospects for US leadership in doubt, Asia-Pacific countries have a limited set of options for pursuing regional cooperation, including not only trade agreements but also other efforts to enhance connectivity and mutual dependence, such as the Chinese-led Belt and Road Initiative (BRI) and the Chiang Mai Initiative Multilateralization.17 Among the options on trade agreements are a reconstituted TPP with the 11 remaining members (TPP-11), the ASEAN-led Regional Comprehensive Economic Partnership (RCEP), and various extra-regional agreements. In this section, I summarize these options briefly. So far, Trump’s election and his visit to East Asia appear not to have reinvigorated the RCEP negotiations. This is somewhat surprising, particularly if we accept the common wisdom that RCEP is a vehicle for Chinese leadership in the trade realm; in this regard, Min Ye argues that the BRI is a better vehicle for Chinese regional leadership, as it provides opportunity for connectivity, deep integration, and expansion of regional trading networks without requiring tedious and contentious negotiations over each tariff-line or particular non-tariff barrier.20 Thus, China has not pushed on RCEP to the extent that outside analysts have expected. Instead of RCEP, regional economies have chosen one or both of two strategies for reducing their vulnerability to US trade pressure. First is the emergence of TPP-11, now renamed the Comprehensive and Progressive Agreement for Trans-Pacific Partnership (CPTPP). The Japanese government was instrumental in resurrecting TPP following Trump’s statement of withdrawal and the failure of Prime Minister Abe to persuade him to reconsider earlier in 2017. While negotiations had already been progressing on how to modify TPP to make it more attractive to the remaining members (mostly by removing items that had been of particular interest to the United States, such as data exclusivity for biologics and investor-state dispute settlement), Trump’s Asia visit created new incentives to move forward with TPP-11, and the members announced a tentative agreement on November 11, before Trump had even left Asia.21 Economic analysis shows that TPP-11 is a pale shadow of the original TPP in terms of its economic impact,22 but it serves several purposes for Japan and other leading members. Like the original TPP it lays down a marker that the members are not willing to cede leadership in the Asia-Pacific to China, and instead seeks to create a high-standard mechanism for deep economic integration. It is also a rebuke to the Trump trade agenda, making clear its members’ preference for a multilateral, rules-based regional approach rather than arranging themselves in a web of uncoordinated bilateral agreements and making themselves subject to the transactional approach of the Trump administration’s trade team. At the same time, by keeping the TPP agreement and structure mostly intact, it invites the United States (and China) to join at a later date. In this way, TPP-11 offers a practical vision of rule-based regional integration, in contrast with the hollow rhetoric of a “free and open Indo-Pacific region” that Trump presented in Da Nang. It is striking that the most active players in carving out new trade agreements that do not include the United States are the economies that have been most closely intertwined with previous US administrations’ visions for regional economic cooperation. However, they have not flocked to RCEP, which is often portrayed as China’s preferred alternative for a regional trade agreement. The continued preference for creating a liberal, rules-based architecture demonstrates the attractiveness of that traditional US approach to trade policy, but the voluntary absence of the United States undermines prospects for TPP-11 to set rules beyond the participating countries themselves. The BRI offers an alternative mode of regional cooperation, based on Chinese leadership.25 The Chinese vision of integration uses infrastructure development to draw the region together through physical connectivity, joint planning, public-private cooperation, and regional financial flows. While BRI serves other purposes, including building regional political influence and providing markets for Chinese materials industries suffering from overcapacity, it is important not to lose sight of its potential to promote regional integration including through trade and investment. This is true even if new regional or bilateral FTAs are not established to support BRI-induced economic regionalization. The BRI is, by the nature of its emphasis on fixed infrastructure, geographically bounded. However, the economic development that it promotes is open in principle. That is true not only of the build phase (although many US and Japanese officials and firms have expressed their skepticism that Chinese-funded projects will be open to contracting with foreign firms). More importantly, if economic development objectives are successful, locals and foreigners should be able to take advantage of the business opportunities that result, just as American and European electronics and IT hardware producers were able to benefit from the regional production networks created with Japanese money in Southeast Asia in the late 1980s.26 That said, this would be a Chinese-led regional architecture, with Chinese state-owned enterprises and financial institutions as leading players shaping the economies and possibly politics of neighboring countries. Despite the potential for profits and the natural excitement of such a large-scale project of connectivity, there remain many in Asia who are suspicious of Chinese intentions and prefer to build alternatives to a Chinese-led regional order. Both the United States and Japan have recently shown signs of warming to BRI. The United States sent a delegation to the May 2017 BRI summit in Beijing, and the Trump administration has made clear its interest in having US firms participate in BRI projects. Japanese firms have also shown interest, while the Japanese government has conditionally offered its support for BRI if “the initiative will contribute to regional and global peace and prosperity by adopting ideas held by all in the international community.”27 Perhaps more importantly, the Asian Development Bank (dominated by Japan and the United States) has asserted its willingness to cooperate on BRI projects. There have been reports that Japan and the United States are seeking to create an alternative infrastructure plan to the BRI,28 but this appears to add little to the existing Japanese efforts to promote “high-quality” Japanese-built infrastructure against their Chinese competitors. Until the election of Donald Trump, the United States was always the natural candidate for leadership in creating and recreating a regional, rules-based order. Its presence as a rule maker and enforcer, while sometimes frustrating, was reassuring to states that needed an enforcer of WTO norms, even if actual US behavior was often self-interested or inconsistent. The United States also served, if not always willingly, as the source of much of the demand for Asia’s excess production. The Trump administration has rendered the United States less fit for those purposes—not to mention, far less predictable. At the same time, there is no single state that is in a position to step in and take its place. Therefore, countries like Japan are now grappling to find ways to shelter themselves from US trade pressure even as they try to limit their dependence on the enormous productive capacity and markets of China. There is simply no good substitute for the role that the American state and economy had filled (if not always perfectly or selflessly). For now, Japan and the other TPP-11 members have chosen to pursue multiple strategies to prevent the creation of a regional rules vacuum and to minimize reliance on a rising but unpredictable China. These include seeking to partially recreate the TPP agreement (with the hope that the United States will someday rejoin), taking advantage of the benefits of China’s transnational development effort, and diversifying market access and political relations through building new FTAs and investment frameworks. These patterns of resistance and hedging are also likely to constrain the Trump administration’s options in Asia, which should be of additional benefit to Japan, South Korea, and their neighbors. Meanwhile, China is taking the initiative, with its concrete vision of a connected Asia providing an alternative mechanism for regional integration. At a critical moment in history, the Trump administration’s revanchist mercantilist approach threatens to make the United States a spectator in the creation of Asia’s new regional economic architecture—and to have little to show for its “America First” policy in Asia beyond trade disputes and some token BRI contracts. This is the true legacy of Trump’s Asia visit: an increasingly integrated Asia, increasingly divided from the US economy. 1. “Full text: Donald Trump 2016 RNC Draft Speech Transcript,” Politico, July 21, 2016, https://www.politico.com/story/2016/07/full-transcript-donald-trump-nomination-acceptance-speech-at-rnc-225974; “Donald Trump Laces into Japan with a Trade Tirade from the ’80s,” The New York Times, March 7, 2017. 2. “The CBS News Republican debate transcript, annotated,” The Washington Post, February 13, 2017. 3. “The Inaugural Address,” White House, January 20, 2017, https://www.whitehouse.gov/inaugural-address. 4. See, for example, Christina Davis, Why Adjudicate? Enforcing Trade Rules in the WTO (Princeton: Princeton University Press, 2012). 5. “Statement of Robert E. Lighthizer before the United States Senate Committee on Finance,” March 14, 2017, https://www.finance.senate.gov/imo/media/doc/2017-03-14%20Testimony%20of%20Robert%20E.%20Lighthizer.pdf. 6. Peter Navarro and Wilbur Ross, “Scoring the Trump Economic Plan: Trade, Regulatory, & Energy Policy Impacts,” September 29, 2016, https://assets.donaldjtrump.com/Trump_Economic_Plan.pdf. 7. The aluminum case was rare not only for its national security justification, but because the investigation was initiated by the Department of Commerce itself rather than at the request of the industry. For details on the investigation, see Department of Commerce, “Section 232 Investigation on the Effect of Imports of Aluminum on U.S. National Security,” https://www.commerce.gov/page/section-232-investigation-effect-imports-aluminum-us-national-security. For summaries of different trade remedies and their uses, see Chad P. Bown, “Steel, Aluminum, Lumber, Solar: Trump’s Stealth Trade Protection,” Peterson Institute for International Economics Policy Brief, 17-21, June 2017. 8. “G20 financial leaders acquiesce to U.S., drop free trade pledge,” Reuters, March 18, 2017, https://www.reuters.com/article/us-g20-germany-trade/g20-financial-leaders-acquiesce-to-u-s-drop-free-trade-pledge-idUSKBN16P0FN. 9. Jonathan Lemire and Jill Colvin, “Donald Trump Says His Asia Trip Has Been ‘Tremendously Successful,’” Time, November 14, 2017, http://time.com/5022965/donald-trump-asia-trip-duterte/. 10. See, e.g., Joshua Kurlantzick, “Trump Put in the Time on His Asia Trip, but He Got Little in Return,” World Politics Review, Wednesday, Nov. 15, 2017, https://www.worldpoliticsreview.com/articles/23611/trump-put-in-the-time-on-his-asia-trip-but-he-got-little-in-return. 11. “Trump’s $250 Billion China Haul Features Little of Substance,” Bloomberg News, November 8, 2017. 12. White House Press Release, “Remarks by President Trump at APEC CEO Summit | Da Nang, Vietnam,” November 10, 2017, https://www.whitehouse.gov/the-press-office/2017/11/10/remarks-president-trump-apec-ceo-summit-da-nang-vietnam. 14. “Japan Fin Min Says Won’t Use FTA to Resolve U.S. Trade Imbalance,” Reuters, November 6, 2017. 15. The Washington Post, September 14, 2017. 16. Keith Bradsher, “Trump Promotes Deals in China, but Hints at Long Trade Fight Ahead,” The New York Times, November 9, 2017. 17. Min Ye, “China and Competing Cooperation in Asia-Pacific: TPP, RCEP, and the New Silk Road,” Asian Security 11, no. 3 (2015): 206-224. 18. See Barbara Kotschwar, Julia Muir, and Jeffrey J. Schott, Understanding the Trans-Pacific Partnership (Peterson Institute for International Economics, 2013); Peter Petri, Michael Plummer, and Fan Zhai, The Trans-Pacific Partnership and Asia-Pacific Integration: A Quantitative Assessment (Peterson Institute for International Economics, 2012); Peter A. Petri and Michael G. Plummer, “The Economic Effects of the Trans-Pacific Partnership: New Estimates,” Peterson Institute for International Economics Working Paper Series, WP 16-2, January 2016. For an analysis of the trade-offs involved in securing the agreements, see William W. Grimes, “Japan and the United States in the Transpacific Partnership: Costs, Benefits, and the Politics of Getting to Yes,” Asan Forum 2, no. 1 (January-February 2014), http://www.theasanforum.org/tpp-1/. 19. See Peter A. Petri, Michael G. Plummer, Shujiro Urata, and Fan Zhai, “Going It Alone in the Asia-Pacific: Regional Trade Agreements without the United States,” Peterson Institute for International Economics Working Paper Series, 17-10, October 2017, p. 4 for a recent status check on RCEP. (Statement by Foreign Minister Taro Kono),” November 11, 2017, http://www.mofa.go.jp/press/release/press4e_001788.html. 23. “EU and Japan Finalise Deal for Trade Zone Covering 30% of Global GDP,” Financial Times, December 8, 2017. The Japanese government was in such a hurry to conclude the agreement that it agreed to set aside the chapter on investor-state disputes as a separate deal. 24. European Commission, “Overview of FTAs and Other Trade Negotiations,” updated November 2017, http://trade.ec.europa.eu/doclib/docs/2006/december/tradoc_118238.pdf. 26. William W. Grimes, “The Belt & Road Initiative as Power Resource: Lessons from Japan,” Asan Forum (April-May 2016), http://www.theasanforum.org/the-belt-road-initiative-as-power-resource-lessons-from-japan/. 27. Charlotte Gao, “‘Aimai’: Japan’s Ambiguous Approach to China’s ‘Belt and Road,’” The Diplomat, November 22, 2017. 28. Shannon Tiezzi, “In Japan, Trump and Abe Offer Alternative to China’s ‘Belt and Road,’” The Diplomat, November 8, 2017.